The impetus for our Swiss trip came when Mitra's week long summer workshop in Saint Gallen in northern Switzerland, was confirmed. Accompanying him for a week, during which he would spend the majority of the day designing lenses was not a good idea but allowing him to romance alone with the Swiss highlands was also not an option. However Mitra never fails to enchant me and without wasting valuable moments he reserved our trip to Zurich for the week following the workshop. Switzerland is well known for the vacillating alps, the cheese rich fondue, the peaks of Titlis and Jungfrau and the crowded touristic cities like Zurich, Geneva and its capital Bern. Now that a trip there was booked we started looking for some quaint less crowded but exquisite location to romantically stroll on the highlands with the alps looking down upon us. It was not long into our research that we stumbled upon this particular location, which is called the Queen of the mountains and the name was justified only when we reached it and discovered the marvels it had to offer. Though Switzerland may seem synonymous with the Alps, a major part of it is occupied by the Jura mountain range and the Swiss plateau. Rigi is located in the Swiss plateau and at a height of 1797m it provides a vantage point which offers a view surrounded by the Alps and the Jura. That year we lived in the Netherlands. We took the Easy Jet flight from Amsterdam to Basel and it was an uneventful journey except the fact that Mitra's bag pack with his laptop was stolen from the train at the Schipol airport in Amsterdam. But the sights we would cherish for the next four days was a strong enough motivation to quickly forget the loss. 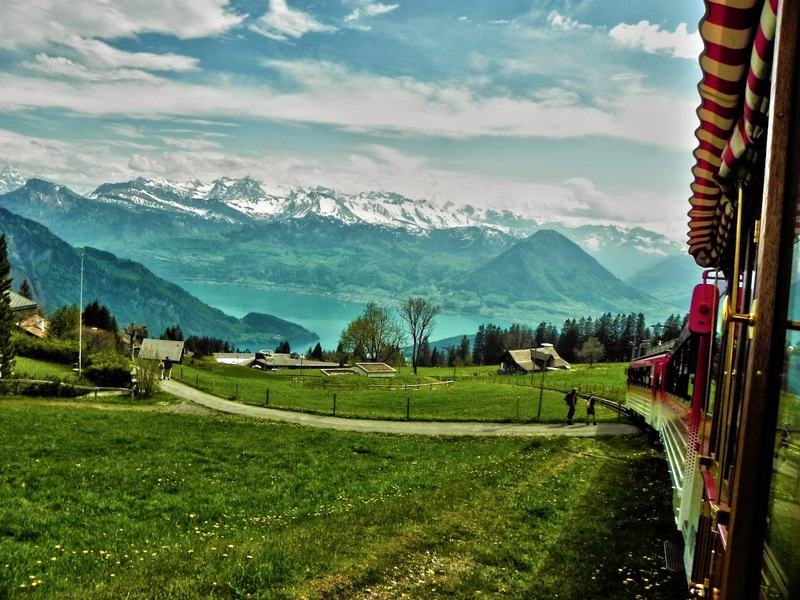 Transport in Switzerland is quite expensive unless one gets hold of the Swiss pass which offers unlimited travel in trains, buses and boats within the country. Even then at €226 per person for four days it is not at all a respite for the pocket. But we can consider ourselves to be lucky or be proud of our timing the vacation. We went to Switzerland in April and the Swiss pass offered a 50% discount for that month and thus it made up somewhat for the loss of Mitra's cherished lappy. The train network in Switzerland is remarkable with them climbing and descending the wavy land form at ease. 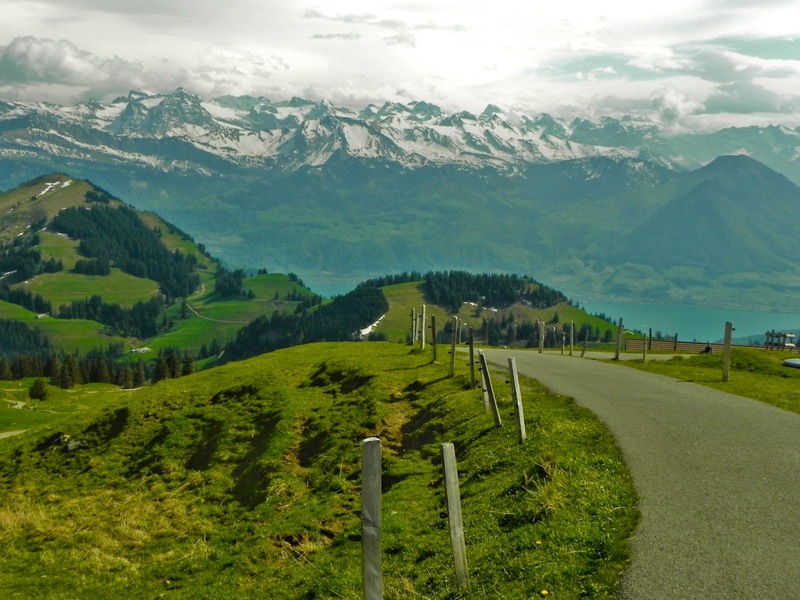 Rigi is massif in the Swiss Plateau with its peak, the Rigi Kulm that is easily accessible by public transport. The two towns of Vitznau on the lake Lucerne and Arth on the lake Zug lie on the southern and northern foot of the massif respectively. Swiss engineer Niklaus Riggenbach designed the Vitznau-Rigi and the Arth-Rigi Railway in the mid-19th century which would guide trains across steep climbs by means of cogwheels and toothed racks. 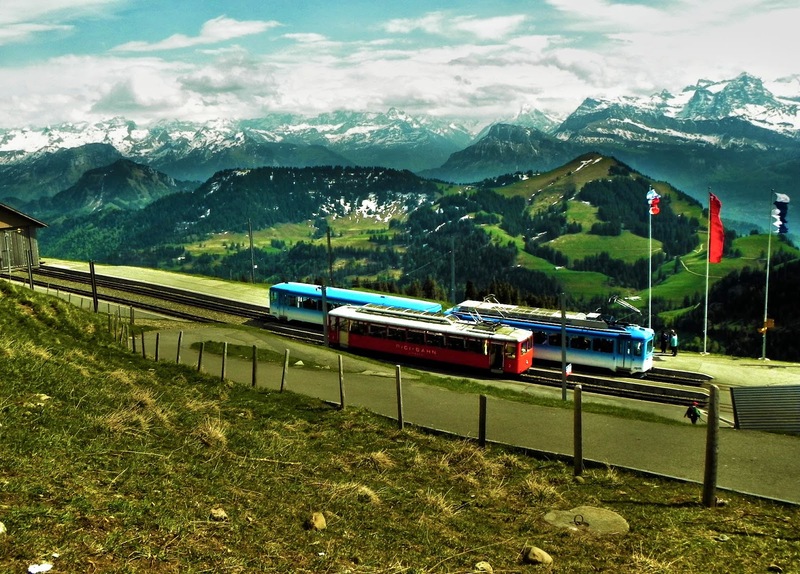 The Rigi Railways are the highest standard gauge railway in Europe and the first mountain rack railway in Europe, and only the second in the world, after the Mount Washington Cog Railway in the United States. 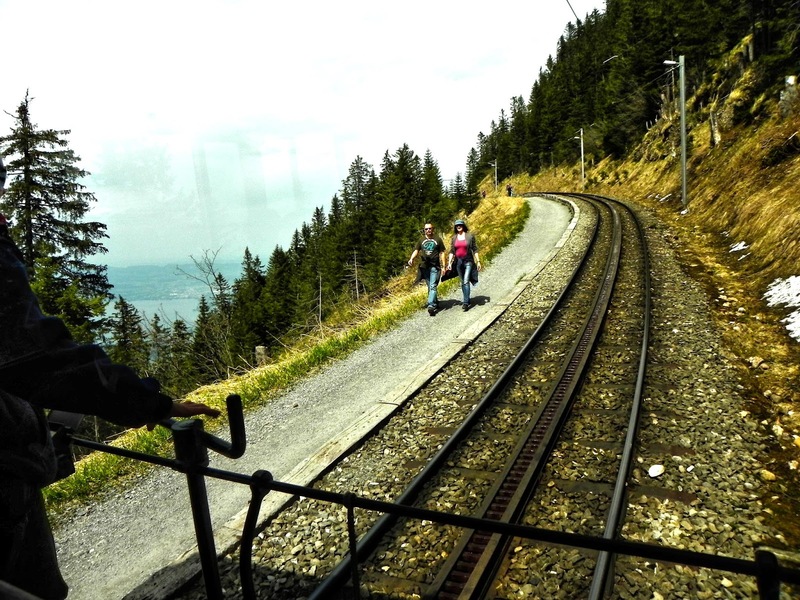 We choose this option to reach Rigi Kulm over a more recent cable car option that was put in service in 1968. 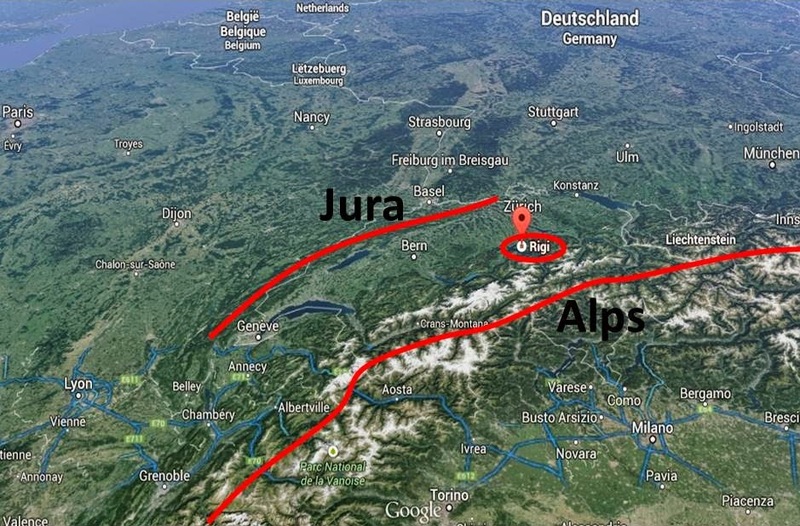 The best part was that both these two historic rail routes were included in the Swiss Pass and thus we did not need extra tickets to reach the top of the Queen of the Mountains. Arth is connected by train to Zurich and we used it to get us back. But the only way to reach Vitznau is by boat from Lucerne, the beautiful city on the lake of the same name. It takes around 45 minutes from Zurich to Lucerne and we reached there just before midday. 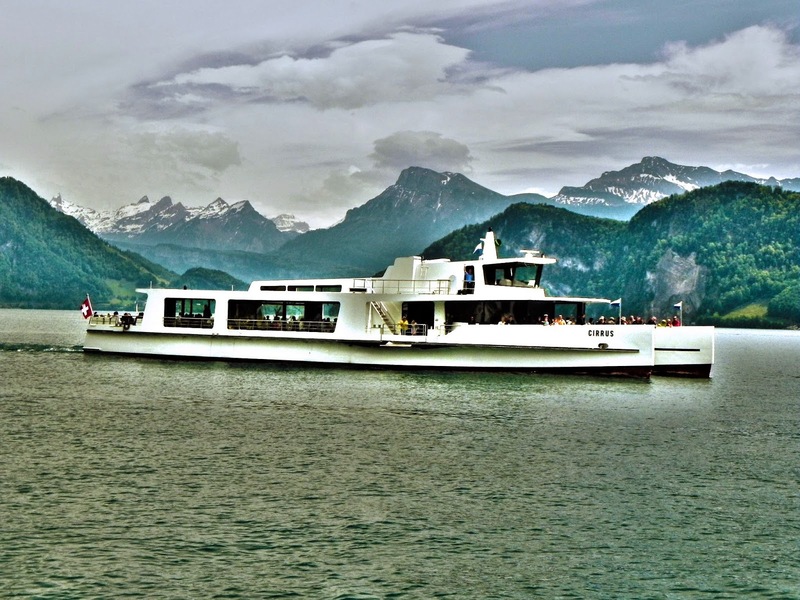 There is roughly one boat every hour that traverse the lake departing from Lucerne. 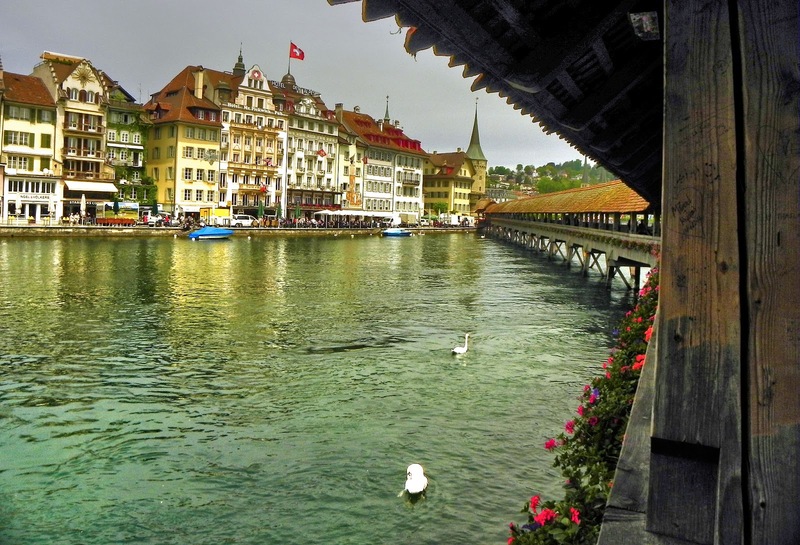 We decided to skip one just to have about an hour to explore the charming city of Lucerne. We must mention that one hour is not enough to soak in this city but we had just enough time to take a stroll, a perfect clear view of Mount Pilatus looking over the city and walk up and down the iconic covered Chapel Bridge (Kapellbrücke). Just like any other lake in Switzerland, with crystal clear waters, charming little villages dotting the coast and steep peaks soaring above it, Lake Lucerne offered a peaceful retreat and raised our expectations of the beauty we would be able to behold from Rigi Kulm. Riggenbach had patented, in France in 1863,the rack-and-pinion system which is a system of toothed racks set between the railway tracks interlocking with cogwheels fitted under the locomotives. As early as 1907, the electrified service on the Arth-Rigi Kulm mountain route was inaugurated making it the first standard gauge rack-and-pinion railway in Switzerland which changed to electric traction. Two steam locomotives are still in service but we were not lucky enough to experience them. However the one we used was a 1930 wooden carriage with the drivers cab present just in the passenger cabin. This offered us a first hand view of the operation of the rack and pinion rail, and the beautiful view as the train spirals up the peak. Heading up the mountain really slow things down and the Europe's oldest cogwheel railway climbs the mountain at a leisurely pace. The hustle and bustle of everyday life slipped away as we climbed to ever greater heights. The magnificent views, fresh mountain air and hiking and walking trails through this vast natural wonderland invigorated the body and mind. After the peace and quiet of our unforgettable Alpine adventure, we were full of energy and ready to make a fresh start. We reached Rigi Kulm late in the afternoon. 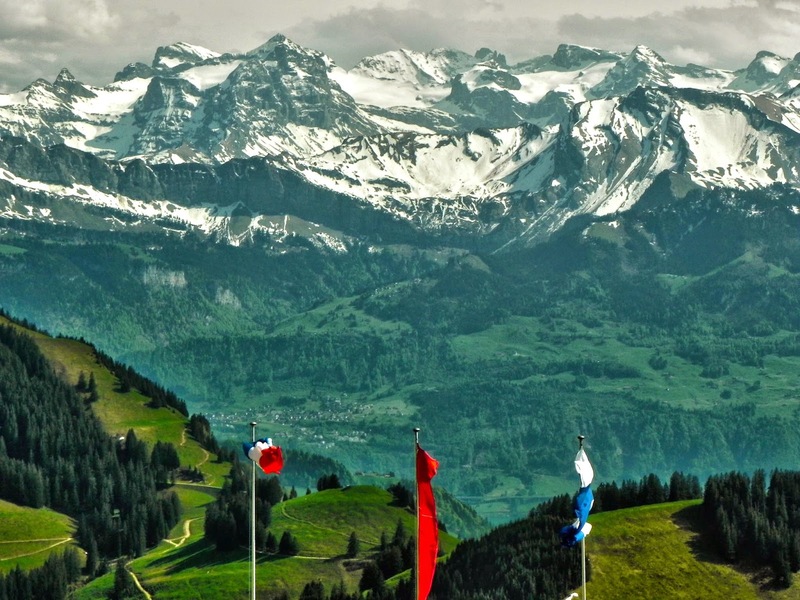 Rigi is called the Queen of the mountains because its name was thought to have derived from the Latin Regina (Queen) which is however not accurate. But the title of Queen for it is apt and on top one cannot help but feel like a king overlooking the vast expanses of his mountain kingdom. Because of its advantageous location between the Jura and the Alps, Rigi Kulm offers a majestic 360° panorama with views of the Swiss plateau and and the wide stretch of Jura, as far as the Black Forest in Germany, the Vosges mountains to the north and the ring of mountains from the Glarus Alps to the Bernese Alps in the south. This is also the only place which offers a view of the 13 lakes of Switzerland, however we could count only as much of 11 owing to a bit of fog and some low lying clouds. The lazy promenade on the peak is something we would always remember. I generally prefer the sea and the mountains always seem rough to me. But the waves of the Swiss mountains with snow covered peaks piercing the horizon and the tiny sails dotting the clear blue lakes below left an everlasting impression of dreamland on our minds. In 1897 Mark Twain lived in Weggis which lies at the foot of Rigi on the northern shore of Lake Lucerne. 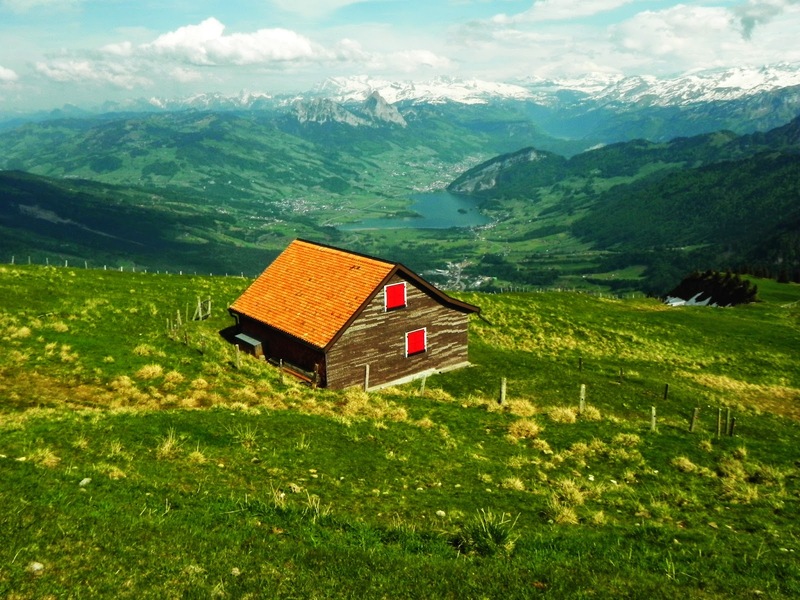 According to him, Rigi is "the charmingest place we have ever lived in for repose and restfulness." We had been welcomed by hordes of tourists in most places during this trip to Switzerland. Thus it was not odd that we were looking for a place to relax, hold hands and drift with the cool breeze blowing over the majestic alps. Rigi answered our call and a walk around the vast green pastures and small pathways made exactly for this purpose, gave us the trills that we experienced 5 years back when we first fell in love with each other. After some new found romance we then started quizzing each other by naming the peaks and lakes that were visible. The quiz is rather easy with the names marked clearly on the maps present on the viewing platform such as Glärnisch, Tödi, Windgällen, Spannort, Titlis, Berner Oberland with Eiger, Pilatus and so on and on...Then we came across this little chalet on the edge of the peak. Overlooking the alps and two lakes in a serene atmosphere, if ever I had wished to own a little house then this would surely be it. There is also a restaurant on the peak, and you should not expect to find Swiss gourmet there. There were enough edible things to fill the stomach and buy some souvenirs but we were not complaining. After charming ourselves for about two hours it was time to catch the last train down from heaven to earth. We took the other train route that goes down to Arth-Goldau and the view was as magnificent as the one from Vitznau. The train slowly spiralled down past lovely chalets decorated with flowers, herds of cows with the iconic trychel cowbell and their enchanting jinglings and some timy streams flowing down towards the lakes bordering the peak. From Goldau we took the train back to Zurich and though drained after the trip, we were filled with contentment for having found, explored and soaked up this little heaven called Rigi. 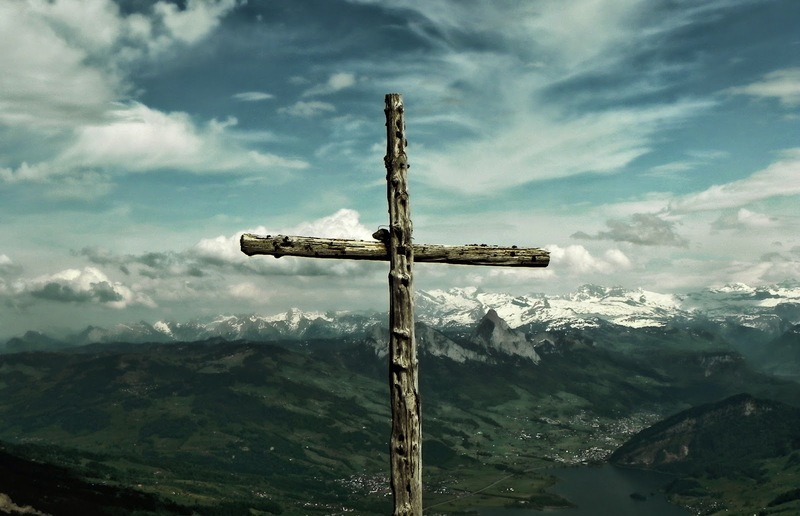 Thus we made a little promise to ourselves, that to visit Rigi once again but next time instead of taking the easy route of ascent by train we would surely hike up the queen of the mountains.